Anyhow, yesterday morning I attended the first of three consecutive Saturdays of Wilton cake decorating courses at the Greensborough Cake Decorating Centre. Normally they are held over five weeks, but they do offer the option of running four of the five lessons in pairs, so we covered lessons one and two out of the Wilton Decorating Basics Lesson Plan. Anyhow, Lesson One covers some baking tips, buttercream consistency, how to use decorating bags and tips, levelling and toring the cake, filling the layers, icing the cake (as in, a plain, smooth base on which to decorate, including crumb coating), some piping practice and using piping gel to transfer a pattern. Sorry about the terrrrrrrrrible photo - I took it with my phone and didn't realise how badly the skylight had reflected on the cake board until I uploaded the photos just now. I've played with the light balance and contrast but it's still not great. Sorry about that. More to the point, sorry to ME because now I don't have a good photo of a cake that I so fabulously decorated. D'oh! If anyone wants this cake for their birthday let me know - it'll give me a great excuse to take a decent photo. Stay tuned for Lessons Three and Four, where we learn to fill and ice cupcakes, pipe flowers and decorate another cake with them. But don't hold your breath because I'll be off learning to make cheese next Sunday at Red Hill Cheese, instead of slothing around in my pyjamas and blogging... Mind you, the only reason I'm slothing about in my pyjamas and not out horse riding with my BFF Ness' twin Dean (still haven't figured out which one is the evil twin...) is because I've come down with one heck of a cold, and I didn't think that being sick and spending four hours on horseback on a nine degree day was ever going to end in anything besides perhaps pneumonia! ACHOO! 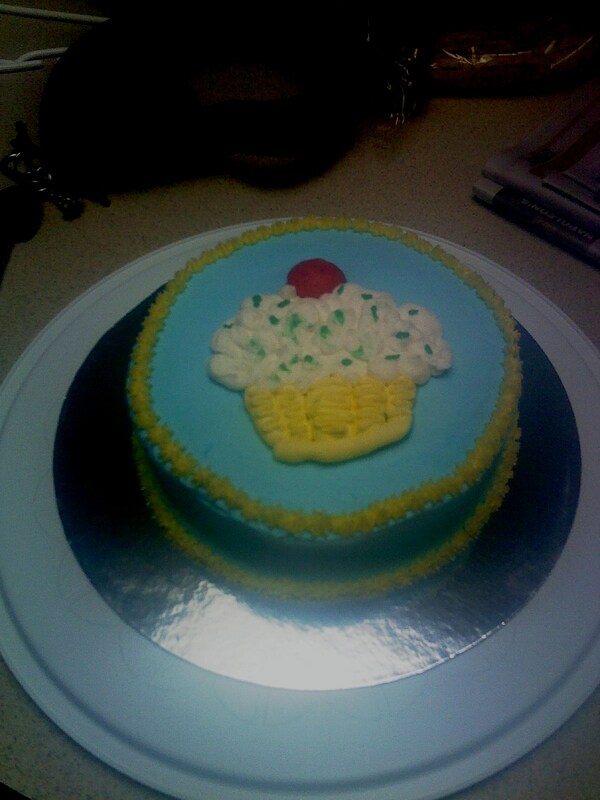 Oh, one last thing - I made a cut-and-keep butter cake from AWW's Bake for this decorating project. It turned out a little flat for decorating, so I would probably double the recipe and take maybe half a batch of cupcakes out of it and bake the rest to get a taller cake, obviously adjusting baking times accordingly. 1. Preheat oven to 160oC. Grease deep 20cm round cake pan; line base with baking paper. 2. Beat ingredients in medium bowl on low speed with electric mixer until combined. Increase speed to medium; beat until mixture is smooth and changed to paler colour. Spread mixture in pan. 3. Bake for about 1 1/4 hours. Stand cake in pan 5 minutes then turn out onto wire rack to cool. Note that these instructions are contradictory to what is found on the informational spread a few pages later, entitled Butter Cake Basics. This tells you to beat your butter until pale, add all the sugar and beat until light and fluffy (scraping bowl as required) but without dissolving the sugar, and then adding the eggs one by one until just absorbed. Then you add the flour and milk alternately and mix until the ingredients have just come together, otherwise the mixture gets tough. Yeah, I don't get why there are two such different sets of instructions so close together either! Awesome. I'm taking a cake decorating course as well, (6 weeks) it starts on the 23rd and I cannot wait. So excited. OMG that is so funny, buttercream is so amazing. Boo indeed :( Hopefully we'll go in the next few weeks though. The best thing about the cake was learning the skills to make pretty much whatever design you want. The possibilities are endless! So excited! You're going to the cheese-making course at Red Hill Cheese! I've thought about doing that once or twice, so I'll be looking forward to your report on it. Fabulous cake, by the way.